The year 2015 will remain historic in Nigeria’s democratic system. Not only because it marks the first time an opposition presidential candidate would defeat an incumbent, but it is also the first time that a ruling party will witness a rebellion by its elected lawmakers in the National Assembly who chose to elect their leaders against the majority party decision. The All Progressives Congress (APC), a product of an alliance of three biggest opposition parties in the country, became the ruling party following President Muhammadu Buhari’s victory at the 2015 presidential election. It is assumed that APC’s failure to also have its preferred candidates emerge as Senate President and Speaker of the 8th National Assembly slowed down governance during its first term. The APC had in 2015 adopted Ahmed Lawan and George Akume as its senate presidential and deputy presidential candidates in the hope that legislators would respect the supremacy of the party as is done in advanced democracies. But Dr Bukola Saraki had his own plan different from that of the party that got him elected. His plan prevailed, while that of his party was trounced. Saraki, who is now in the opposition Peoples Democratic Party (PDP), emerged President of the 8th Senate under the platform of the APC against the wish of the ruling party on June 9, 2015. He is believed to have capitalized on the division within the APC at the time by rallying the support of 41 opposition senators and some aggrieved senators in the ruling party to become senate president. But the former Kwara State governor apparently paid for double-crossing his party as his tenure as president of the 8th senate wasn’t a smooth ride. From being hounded by the Economic and Financial Crimes Commission (EFCC), to his prolonged trial at the Code of Conduct Tribunal (CCT) for alleged false assets declaration, Saraki battled the Federal Government at different fronts. Besides being named in the Panama Papers for alleged corruption, Saraki was also linked to the infamous Offa bank robbery. There were reported attempts at some point to impeach the senate president in July of 2018. The APC leadership was alleged to have met its senators and plotted to impeach Saraki. The senate president was believed to be flirting too much with the PDP, so the alleged plan was to impeach him before his defection to the opposition. This was given credence on Tuesday, July 24, 2018, when the police surrounded the residence of Saraki in an alleged move to prevent him from attending senate plenary so as to impeach him and install a senate president that the ruling party can trust. Saraki’s many battles with the Federal Government are believed to have fuelled the frosty relationship between the legislative and executive arms of government throughout his tenure. The cold relationship manifested in the rejection of executive nominees and the consequent rejection of 17 bills by the executive which include the constitution amendment (Fourth Alteration No. 28) Bill 1999, and the Industrial Development (Income Tax Relief) amendment Bill. Political analysts think that the unfriendliness that characterised the executive-legislative relationship in the last four years had also weakened the oversight function of the legislature on the some ministries and agencies of government who refused to corporate with the legislative arm. The APC has not minced words in stating that it is determined to avoid some of the disadvantages that came with the hostility that exists between the 8th national assembly and the executive in the 9th assembly. 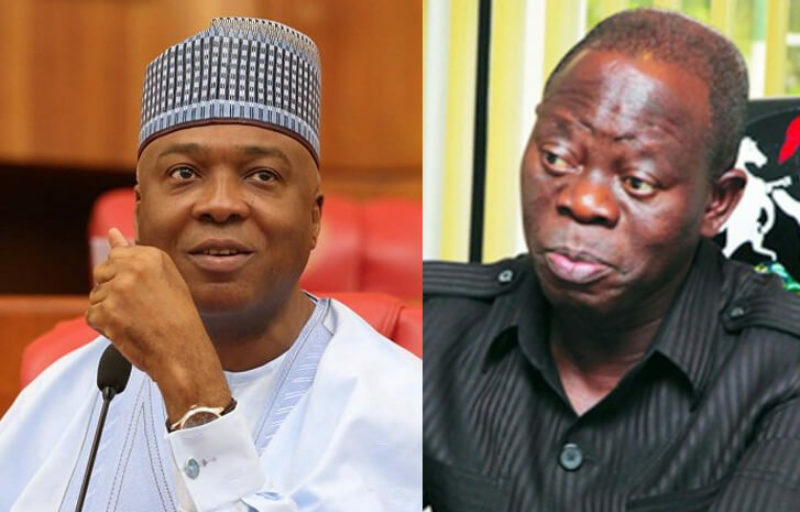 The party’s national chairman, Adams Oshiomhole, has told APC lawmakers of the 9th assembly that the ruling party was leaving nothing to chance to ensure its preferred candidates emerge Senate President and Speaker of the upper and legislative chambers. “As people, who are active, you are very familiar with the issues that bogged down the National Assembly between 2015 and 2019 arising from a unique concussion and I pray that this time around, we have all learnt a lesson from our immediate past and allow the positive lessons of our immediate past to shape our future,” Oshiomhole had said at a recent national caucus meeting of the party in Abuja. At the meeting, Oshiomhole announced APC’s preferred candidates for the leadership of the 9th Senate and House of Representatives as Senate Majority Leader Ahmed Lawan and Hon. Femi Gbajabiamila. But the party’s decision has been openly opposed by Senator Ali Ndume who, like Saraki in 2015, has insisted on becoming senate president regardless of the party’s resolution. “We were surprised on Monday when National Chairman of our party told us a decision had been taken to adopt Ahmed Lawan as candidate from the North East for the position of the President of the Senate…such a decision was taken and we were not given the chance to ask questions. We were not allowed to make comments,” Ndume had said in reaction to how the APC arrived at the choice of Lawan. The party has also been accused by some other lawmakers-elect of trying to impose candidates rather than allow a level playing field for lawmakers with ambitions to test their popularity. But the party’s National Leader, Asiwaju Bola Ahmed Tinubu, had warned that any lawmaker-elect that fails to abide by the party’s resolution will get the “whip”. “We would not take that this time, no matter who you think you are. That is how it is built. Why do you want to deviate from what has been structured? We look at our reward system equally, zone by zone,” Tinubu had told lawmakers-elect opposed to the party decision. Should the APC persist in threatening its lawmaker’s with eviction from the party unless they agree with its choices for the NASS leadership, the party may cause the 9th assembly lawmakers revolt. If that happens, the APC legislators may team up with opposition lawmakers to elect principal officers that aren’t the party’s choices. But there are indications, however, that in order to avoid the Saraki saga of 2015, the party may have soft pedalled on its rhetoric regarding the leadership of the national assembly as they are said to now be encouraging consultation on how to get the lawmaker’s elect NASS presiding officers that would work with President Buhari to achieve his agenda and manifesto in the next administration.